Monitoring and managing your system’s performance is critical to ensure that you are keeping pace with the changing demands of your business. To respond to business changes effectively, your system must change too. Managing your system, at first glance, might seem like just another time-consuming job. But the investment soon pays off because the system runs more efficiently, and this is reflected in your business. It is efficient because changes are planned and managed. While understanding all the different processes that affect system performance can be challenging and resolving performance problems requires the effective use of a large suite of tools, the functions offered by IBM i are intended to make this job easier for users. 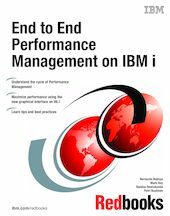 This IBM Redbooks® publication explains the tasks and rich tools associated with performance management on IBM i.